Seven feet, one and one-sixteenth inches tall was Wilton Norman Chamberlain. No one, however, believed him. He once said to me, "I could tell a little person, 'Oh, I'm 10'3",' and he would answer, 'No, you're taller than that.'" To almost everyone he encountered, Wilt appeared simply larger than life, a human optical illusion. He loomed. It was as if he blocked out the sun. Were it only that. Were it only everyone else's perception. But the irony was that Wilt Chamberlain, who died of a heart attack last week at 63, was never quite big enough even for himself. Especially in his prime, he constantly felt compelled to do more, to be better, to go higher. For someone so curious and sensitive, he was too influenced--seduced, even--by his own physical preeminence. In a world where he knew he was the Most Man, he never would allow himself the legal dictum res ipsa loquitur: the thing speaks for itself. No, Wilt needed numbers to validate himself. If the most points were not enough, then he would get the most rebounds, then the most assists. Never take a rest. Never foul out. Alas, near the end, when he crowed of having had assignations with 20,000 women, that numbing statistical braggadocio made him a figure of fun. Always before he had been controversial, often even villainous, but never foolish. As bad as his judgment was in that case, he didn't deserve ridicule. Wilt's other flaw, you see, was that he was a very nice and gentle man. His best friends called him Dippy, which is hardly a name we associate with ogres and giants. David and Dippy? I don't think so. Bill Russell even pointed out that if Wilt had possessed a mean streak, there would have been no stopping him. On the one occasion when Wilt was very angry at me, he delegated Jerry West to suggest that I depart from the Los Angeles Lakers' locker room; he couldn't bear such confrontation himself. In fact, I rarely recall that great deep voice rising in anger, although, coincidentally, the last time I saw Wilt, we fussed as friends. "Sometimes, my man, you take a right turn, and I just don't know where you are going!" he groaned, alluding to something I had written. By chance, someone snapped a shot of me then, pointing what appears to be a menacing finger at Wilt. I look at that photo now--Wilt in some outrageous Arabian Nights outfit--and I'm amazed at how surprised and cowed (well, he was sitting down) he is, reacting to my impolite gesture. It shames me because I know Wilt never would have acted so intemperately toward me or any other mere mortal. He was careful not to scare the little people. A little late, but: I apologize, my man. This night in question was last May, in Boston, where Russell was being celebrated. Wilt had flown across the country on his own hook, even though he knew that he was traveling 3,000 miles just to be the evening's appointed bad guy. No matter. He had learned to endure the cape of villainy slung round his shoulders. Wilt always recognized that the loss that hurt the most--and that set the precedent for his being perceived as a loser--was his Kansas team's triple-overtime defeat by North Carolina in the 1957 NCAA final (in which, in fact, he played valiantly). Afterward, he morosely walked the rainy streets of Kansas City, and when he left college after the next season, it would be another 40 years before he returned to the campus. The shame he inflicted on himself for this defeat simmered for that long. "That goddamn one against Carolina," he would mutter. Worse, at the beginning of the game Tar Heels coach Frank McGuire had sent out his shortest starter, 5'10" Tommy Kearns, to jump center against Wilt--or, really, to call mocking attention to Wilt's height. Cruelly, it worked; it hurt him. Yet McGuire would become Chamberlain's coach with the Philadelphia Warriors in his greatest quantitative season--50.4 points a game, in 1961-62--and Kearns would become his friend and stockbroker. So there Wilt was in Boston for Russell, too, ready to take his public lumps to help honor his old friend and foe. Oh yes, the January before last Wilt finally went back to Kansas, where he put on his old letter jacket (which still fit perfectly) and watched as his jersey was raised above the court at Allen Fieldhouse. "I felt like I let the university down," he told the crowd. "No, no!" the Kansans cried back. 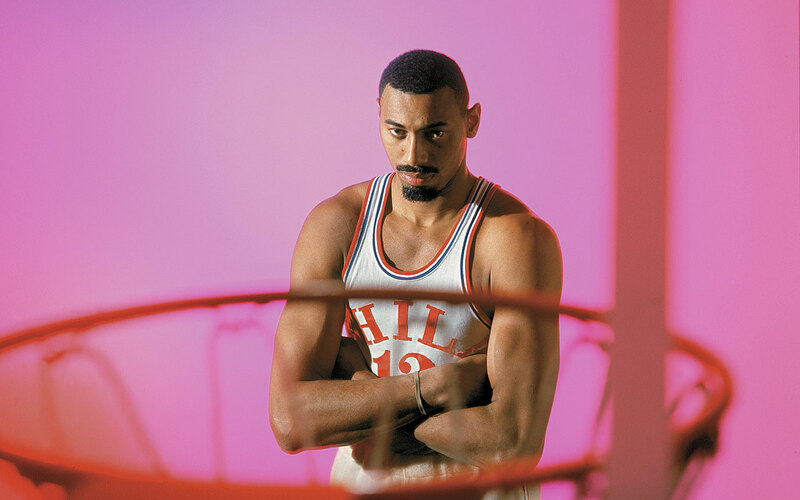 "Rock, chalk, Jayhawk," Wilt said softly, and he cried. There was that sweet side the hugeness screened. For example, for all his masculine swagger and the sexual stats, Chamberlain counted many women among his friends and personally financed women's track and volleyball teams. He was a devotee of women's tennis. In a phrase almost Victorian, Wilt always decorously referred to his women as young ladies, even as he felt he had to total them up. He never married, and he told one of our mutual friends that only once, when he was playing in San Francisco in the mid-1960s, did he ever contemplate such a possibility. He simply didn't want to forgo his independence, and anyway, in an overpopulated world, he said, "I feel no need to raise any little Wilties." Although he always lived alone, Wilt never seemed to be a lonely man. He had learned to love Goliath. He was accessible. He relished a debate, adored travel and delighted in an eclectic range of the globe's roster of human beings. Indeed, it may be most revealing that, of all his basketball years, the one he enjoyed most was the one between leaving Kansas and joining the NBA, when he was a Harlem Globetrotter, globetrotting with no pressure on him to perform heroically, to quantify anything. I always thought that Chamberlain would have been much more content in an individual sport--such as track and field, in which he excelled, disparately, in the high jump and the shot put. The conflict between team and personal supremacy forever confounded him. There's no doubt that he could do, by himself, almost anything he ordained. I learned that myself, just as the centers he toyed with under the hoop did. In 1969 I wrote a cover story on Chamberlain for SPORTS ILLUSTRATED. He was 32 then, his great scoring days were behind him, and I ventured this memorable line: "There is a growing school of thought that he no longer possesses sufficient moves to make him a bona fide high-scoring threat." It had, in fact, been more than a year since he had made 50 in any game. So: The very next game he played after the magazine came out, Wilt went for 60. Yet in the seventh game of the NBA Finals that year, Russell's swan song, the man who never missed a moment of any importance on the court took himself out of the game, sore-kneed, when the Lakers fell behind the Boston Celtics. Only when Los Angeles rallied without him did Chamberlain petition to go back in, but coach Butch van Breda Kolff refused. It cost van Breda Kolff his job. It cost Wilt more, his image. His defenders--and it almost defined what sort of a person you were, whether you fell into the Chamberlain or the Russell camp--always maintained that Chamberlain would have won as many championships as Russell did if he had been lucky enough to be surrounded by the deep Celtic green. "No," Bob Cousy said not long ago. "To play with Wilt you had to go down, set up and wait for him. We couldn't have played that way." It was not, really, that Chamberlain wasn't a team player. That's simplistic. In his great cathedral house in Los Angeles he kept not a single trophy attesting to his individual achievements, except for his Hall of Fame certificate. He gave all the others away. "They make other people happier," he told me matter-of-factly. Rather, I think, he was just so dominating a presence that he overwhelmed his own team. He was, ultimately, primarily an opposing force. Whereas players like Russell made their teammates better, it was Chamberlain's fate to bring out the best in the opposition. Finally he awoke one summer's morning on vacation on an island somewhere in the Adriatic and understood that. "There was always so much more pain to my losing than there ever was to gain by my winning," he explained. It was time to quit basketball. The rest of his life was much happier. He went barefoot and could play at being Wilt more than having to be him all the time. And if there is a heaven, my man, it's a place where nobody has to shoot free throws.